Sitting in a forgotten room under the streets of Moscow in the Zoological University basmement is a large iron machine. The machine has been looked after and protected from demolition for the last fourty years by it’s guardian, Stanislav. the machine, called ‘ANS’ , looks like an old printing press, it is black, and smells of oil and ink. the ANS takes time to start up when its fabric covered cables are connected, its cogs spin and the glass plates whirr. It hums loudly. The function of the ANS would be impossible to determine from it’s appearance: The only part of the machine that gives a clue to it’s intended purpose is a small ‘piano’ keyboard vertically positioned next to a greasy inked glass plate: The ANS is infact a musical instrument, an early synthesiser, conceived by the jazz loving military scientist Yvgeny Murzin during the Second World War (or ‘Great Patriotic War’ in Russia). Murzin’s ambition was to create a universal instrument that would combine the visual and audio aspects of composition in one machine(Murzin christened the machine the ‘ANS’ after Alexander Nikolayevich Scriabin who’s synaesthetic theories were very influential in the USSR at the time), freeing the musician and composer from the restaints of standard composition and giving them an unlimited palette of sounds. The basic theory of the machine was to rebuild a sound from it’s visible image – echoing Scriabin’s ‘colour organ’. At the heart of the machine was the sound generator: 144 glass disks, each disk containing multiple pure sine waveforms which when spun at varying speeds produced multiple and complex combinations of tones. The sound was created by directing a light beam through the spinning glass disk to a photo-electric cell – which in turn created a voltage tone output whcih could be heard through a set of speakers. Incredibly, each of the 144 glass discs were hand drawn, in itself a phenomenal task which took many years to complete. Following Murzin’s light-to-sound design of the ANS was the control mechanism. The composer simply wrote into a glass plate covered in black ink – the higher the line the higher the pitch (generated from the glass disks) the lower the line, the lower the pitch. The horizontal axis of the plate represents time, so the length of the line determines it’s longevity. To play the composition a ‘light reading head’ traveled over the inked plate and picked up a light beam shining through the lines made by the composer ( interestingly, the speed of the ‘play head’ could vary without altering the pitch or timbre of the piece a unique and powerful musical and composition tool). The vertical keyboard manual when presssed created straight lines in the ink – therefore producing fixed interval tones. While all this delphinic research was going on the ANS was beginning to be used by a new generation of electronic composers ( including Edward Artemiev – composer of soundtracks to Tarkovsky’s films ‘Stalker’ and ‘Solaris’, Oleg Buloshkin, Vladimir Martinov, Edison Denisov, Sofia Gubaidulina, Alfred Schnittke, Alexander Nemtin and Stanislav Kriechi – the ANSs’ keeper) who had realised the potential of the instrument. Jean-Hervé Peron of Faust, featuring Jean-Hervé Peron and Geraldine Swayne [also of …bender], with sunseastar [Dield Recordings] and DJ Tango-Mango of the Komische Club / Drones Club star in this evening of experimental noise and organic, avant-drone. As a founder member of Faust, Jean-Hervé Peron was instrumental in doing nothing less than changing the face of rock music. As sunseastar, members of RBE and Bourbonese Qualk, Simon Crab and Andy Wilson have been making electronic music for over 25 years. 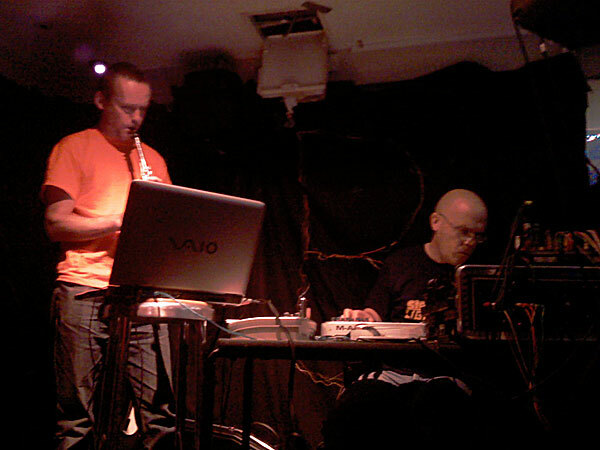 In their incarnation as sunseastar they create music from computer processed location recordings. sunseastar will release their first album, ‘Fjaerland’, later this year, based on recordings made in Norway and the UK. DJing is DJ Tango-Mango of The Komische Club and Drones Club. For the last 11 years, the Kosmische Club has established itself as a place to hear some of the most forward-thinking, truly independent and downright amazing music ever made. Cherished by the open-minded, loved by the chronically energetic, and only occasionally visited by old men with beards, the Kosmische club’s remit slowly began to include the best danceable, experimental music, non-chin-strokey electronica, and classic underground tracks. ‘FASE’ was a cassette only release on the Netherlands ‘Staalplaat‘ label released, i guess, in 1984 (?). A video taken just outside of our house in Hastings. To mark the end of ‘Hastings Week’ (yet another excuse for general drunkenness and ribald behavior) there was a torchlight parade through the old town by fire carrying, firework throwing pagan marching bands and stocky men and women dressed as corpses, pirates, devils and skeletons. The whole thing culminated in a massive bonfire on the beach where crucifixes were set ablaze (how we cheered!) and fireworks ignited at dangerously close proximity. A plan that was hatched to storm the nearby St Mary’s centre (occupied by Christian extremists) and throw some believers into the blaze, was, alas, abandoned in favour of acquiring more booze before the offie closed. Next year perhaps. Yesterday Space Studios (of which i am a trustee) hosted a round table discussion to plan the future of Launchlab: Launchlab is a Space Studio project that aims to resolve issues of diversity amongst the creative community i.e. The digital media and communications industry is an extermely hermetic, homogeneous group controlled and run by mainly white middle class males (like me). The Launchlab project is designed to give the same sort of access normally reserved for this privileged group to a much wider and diverse mass of untapped talent in East London. This is done by training, self organisation and industry connections (organising internships, talks, discussions, consultancy and so-on). The strategy is to create a kind of social contract between the established creative industry and Launchlab: The Creative Industries need new people, ideas, talent and access to and a dialogue with, (real) ‘Youth Culture’. In turn Launchlab needs access to and profile within these Creative Industries. Launchlab will relaunch in January 2008 at Space Triangle, Mare street, Hackney. Another chance discovery from my old tapes box (which i hadn’t bothered to look at for twenty years…) is this recording from Bryn Jones’ ‘Eg Oblique Graph’. These two tracks ‘Fall Into Glass’ and ‘Linked to Gaulist Conspiracy’ are from a cassette Bryn sent to me (as usual nicely presented with typographic printed and xeroxed designs – a contrast to the DIY ethic of the time) when i started the Recloose Organisation label around 1981. Shortly after this we released a 7″ 3 track EP ‘Triptich’ of similar material, and shortly after that he changed the bands name to ‘Muslimgauze’ (much to our horror). I think these tracks are some of the best work he ever did – very experimental, inventive and uncompromisingly electronic, to me his later work became too repetitive, formulaic and rather unimaginative. Here’s a recording of Muslimgauze’s first live performance (recorded at the V2 in Dembosch Netherlands on the 20th March 1986). On this occasion Muslimgauze were the support group for bourbonese qualk. Steven Tanza (Stanza, the then drummer with bourbonese qualk) was playing percussion and I ( i think…) was playing bass guitar. Bryn (Jones) was so traumatised by the event that he swore never to play live again. In the photograph right to left, Bryn Jones (with Kevin Keegan style haircut) and Steve Tanza (on the drums). After reading Bill Drummonds book ’45’* I was inspired to write about the Residents: In his book Drummond speaks about how, since the ’70s, the Residents maintained a unique position in ‘new music’; an anonymous surreal almost completely mythical group who’s output was so idiosyncratic it became a genre of its own (fact: the mark of a true innovator is to be so unique as to influence no-one), and how his view of the band was destroyed when, literally, the mask slipped. As far as i know – and i haven’t really checked – I am the only person to have interviewed the Residents as ‘the Residents’. Normally cloaked in secrecy about their true identities I interviewed them in 1994 for James Stevens’s video magazine – and for some reason they were uncharacteristically open about who they really were. The interview was set up, i think, by the folks at Mondo 2000 ( a kind of new age cyber magazine precursor to ‘wired’ that everyone read back then) and took place just after the 1994 earthquake at the Residents HQ in San Francisco; an old warehouse (with a huge vertical crack down the front) surrounded by empty lots. 2. They formed around the group Captain Beefheart and The Magic Band in the early seventies. 3. They currently were getting cheap rent due to earthquake damage but had to move out soon – which they couldn’t afford. More on Het Zweet: A Poster and leaflet from1987. ‘Aniki Bobo’ was a small venue in the riverside ‘Ribeira’ district of Porto which, at the time was a dark and seedy area of cobbled alleys, bars and brothels. (It’s now reincararnated as an upmarket area of quaint cobbled alleys, expensive bars and brothels) . The club was run by one of the few adventurous promoters in Porto (who also ran the Tubitek shop and label) who had booked us to play for two consecutive nights – two nights which have gone down in Porto mythology. Marien did his set which comprosed of percussion loops (on audio cassette) with live percussion from amplified metal junk. The Bourbonese Qualk set on the second day was one long piece played on amplified glass: glass sheets from shop windows, giant glass jars, light bulbs and so-on. The performance was improvised, mixed with live sampling and gradually increasing from subtle almost inaudible sounds to a destructive frenzy of smashing glass accompanied by violent audience participation. Audible on the recordings are the hysterical shouts of the organiser fighting with our sound engineer Kif, as he tries to pull out the cables from the mixer and bring the show to an end. Het Zweet/Marien Van Oers. South London 1986. Nenad Vujic asked me to write something about ‘Het Zweet’ . Nenad said that there is a lot of music from the 1980s which no one knows about because the musicians at the time didn’t have access to the pervasive digital promotional methods that we all have at our fingertips now and that these musicians have no interest in promoting their work from twenty(!) years ago. ‘Het Zweet’: Not a group but one man; Marien Van Oers, native of Breda in the Netherlands active from 1983 to about 1988. The music consisted of long 10 minute percussion pieces played on self built instruments (shopping trolleys amplified with pickups, blown cardboard tubes etc.) whith repetetive shouted vocals by Marien. The music was often placed in the industrial camp and linked with the likes of Test Dept but infact Het Zweet wer more concerned with ‘tribal’ music, physicality and trance effects. During their lifetime Het Zweet released one LP ‘Het Zweet’ originally intended to have been released on my label ‘Recloose Organisation’. Unfortunately the break up of Bourbonese Qualk and Recloose prevented this and it was eventually released on the Berlin based Dossier label – much to Marien’s chagrin. Other titles were all cassette releases on various labels and contributions to compilation records (including ‘psycho pomp’on the Recloose organisations sampler ‘songs from the new international in 1986). We (Recloose) also worked on various video and film projects with Marien (the cover shot of ‘Het Zweet’ LP shows a frame from a video loop of Marien hitting a metal boiler with a pickaxe which was used as a projection during live performances). Het Zweet performed live around Europe often as a support group for Bourbonese Qualk whom he toured with on a number of occasions. The last i heard from Marien was ten years ago – he had stopped ‘experimental’ music and was working playing accordion in a wedding band. ‘Het Zweet’ LP Dossier 1987.